This post was written by Ashley Blackmon-Hynson, senior HR operations analyst at NerdWallet. Learning and bonding through an inclusive, diverse culture is important to the Nerds at NerdWallet. To celebrate this culture, Black Nerds Network (BNN) — an employee-run group that’s focused on building a cohesive and supportive black Nerds + allies community — hosted a Black History Month celebration in February featuring food, culture and giving back to the local community. We partnered with our food and beverage staff to serve weekly themed lunches and promote greater understanding of black and African-diaspora cultures. These lunches were delicious — and they also provided Nerds with a sense of the historical and cultural context of a range of popular cuisines, including Afro-Cuban, West African and Southern soul food. Ashley Blackmon-Hynson prepares Valentine’s packages for Prescott Elementary. 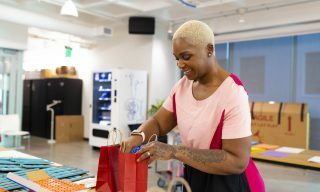 BNN also reached out to two local black-owned businesses — Yvonne’s Southern Sweets and Kaya — for a pop-up day of exquisite desserts, and a catered happy hour featuring Afro-Caribbean beats. Through trivia games like Black History Month Jeopardy!, Nerds expanded their knowledge of the historical and progressive context of both past and current events within black cultures. These games also served as a true bonding experience that continued to build a sense of community and belonging within NerdWallet. Continuing an annual tradition, Nerds volunteered at Prescott Elementary School in West Oakland, participating in the National African American Read-In. 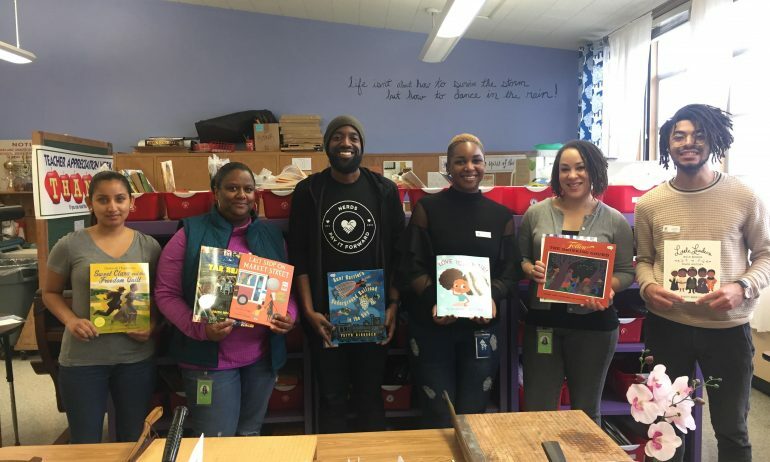 They read books centered around the theme of Afro-futurism to children ranging from kindergarten to fifth grade, then donated the books to the school. BNN also teamed up with the NerdWallet People Ops team to deliver school supplies and handmade Valentine’s Day cards to the 200 students, faculty and staff of Prescott. Black History Month enabled Nerds to come together, have fun and highlight the amazing work happening within black communities. Are you interested in hearing more about BNN or the other employee-run groups at NerdWallet? Email support@nerdwallet.com. We’d love to hear from you! Top photo: Members of Black Nerds Network getting prepped for the read-in. All photos: Kevin Malmgren, NerdWallet.